A colt by Easter graduate Fastnet Rock shone on Day Two of the 2013 Inglis Australian Easter Yearling Sale in Sydney when selling for $4 million to Emirates Park Stud. Offered by Cressfield Stud as Lot 295, the colt by Fastnet Rock from Group 1 winning dam River Dove, demanded plenty of attention as he stepped into Inglis’ sales ring at Newmarket. Bidding started slowly on the strapping youngster before Emirates went toe to toe with Coolmore Stud for the prized colt until the hammer came down at $4 million to the winning bid of Emirates Park CEO Trevor Lobb. “I just loved the athleticism of him, the way he walked, he’s got the best temperament nothing upsets him. One of those horses you don’t see that often at a yearling sale. To us he was the best colt in the sale,” said Lobb. “Fastnet Rock is an international sire, he [Lot 295] is out of a Group 1 winning mare and the type of animal he is, if he can gallop for us he is headline stallion, and he’s the Australian stallion,” added Lobb. John Hawkes, who had tremendous success training for Woodlands Stud when Lobb was General Manager of the Ingham owned operation, will train the River Dove colt, which the pair are hoping will take their new partnership all the way to the top. “It’s good to get the team going again and hopefully we can have the success we used to have. If he [Lot 295] is the right one, he’ll be the right one to have,” Lobb said. The son of Fastnet Rock will be raced in partnership between His Excellency Nasser Lootah and Sheikh Mohammed Bin Khalifa Al Maktoum. The colt’s $4 million tag is the second highest price paid for a yearling in Australia’s thoroughbred auction history, only eclipsed by Black Caviar’s half-brother by Redoute’s Choice that was sold yesterday for $5 million. Replay of yesterday’s $5 million sale of Lot 131 can be seen in InglisTV’s Day One wrap up HERE. “To eclipse the record twice in two days in a great thrill, but we are also stoked with the depth across all buying levels at the sale evidenced by the 18% increase in the median from last year,” said Inglis Managing Director Mark Webster. 249 lots have been sold for total gross receipts of $75,310,000 over the first two days of the 2013 Inglis Australian Easter Yearling. Along with the healthy growth in the gross the average price is also up 36% to $302,450 and median up 18% to $200,000 at a clearance rate of 75%. Easter Sale graduate Fastnet Rock has hit the front of the sires list by aggregate with 33 of his progeny changing hands for $21,240,000 at an average of $643,636 and median of $400,000. Fastnet Rock had three lots make six figures on Wednesday; the $4 million River Dove colt, Kia-Ora Stud’s filly from Mani Bhavan (Lot 194) which sold to James Bester Bloodstock for $1,550,000 and Cressfield’s filly from Park Esteem (Lot 249) which sold to Peter Moody for $1,000,000. Redoute’s Choice provided the other two top lots on Day Two of the sale; Eliza Park’s colt from Black Caviar’s grand dam Scandinavia (Lot 319) sold to James Bester for $1,200,000 and Cressfield’s filly from Star Satire (Lot 346) was bought by John Warren for $1,000,000. 20 yearlings by Redoute’s Choice have been sold by Inglis over the past two days for $13,105,000, leading to an average of $655,250. Of the first season sires the progeny of Medaglia D’Oro have sold up to $500,000, Wanted up to $420,000, All American to $290,000, Manhattan Rain to $220,000, Duporth to $170,000 and Denman to $150,000. “Day One clearance rate has now risen to 82% following the private sale of 14 of yesterday’s passed-in lots for an additional $1,950,000,” Webster pointed out. “There is no compromising by Inglis’ experienced bloodstock team in selecting the best yearlings from Australia and New Zealand into the Easter Sale and I would encourage astute buyers to have a look back through the passed-in lots, for Group 1 winners can be purchased from Easter for less than A$50,000 to more than $1 million. “Gai Waterhouse’s purchase of Epsom Handicap winner Fat Al for just $27,000 at Easter is proof that buyers can aim higher with yearlings from all across the buying spectrum at this quality sale,” said Webster. 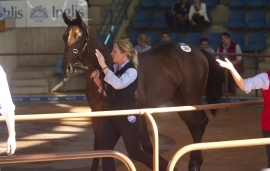 Horses passed in during the Easter Sale are available for sale via the Inglis Make-An-Offer Service. Online Bidding will again by available for those not able to make it to Newmarket for the third and final day of the 2013 Easter Sale tomorrow. Session 1 (Lots 381 to 422) will continue at 11am tomorrow, with Session 2 (Lots 423 to 569) to close out this year’s Easter offerings.